On the 16th of August 2007 after sustained campaigning by UK Sikh youth, Sri Akal Takht, Amritsar reiterated the Reht Maryada for Anand Karaj ceremonies. Sri Akaal Takht Sahib is the Throne of the Almighty and the orders issued by it are called Hukamnamas. Hukamnama, literally means "Royal Order." Participation of someone previously of a religion other than Sikhism in an Anand Karaj ceremony. Dispite this many Gurudwara Comittess across the UK are choosing to abuse this Maryada for financial gains. Include Singh or Kaur in the name - Changing by Deed Poll including Passport & Driving Licence. On the weekend of 25-26 August 07 Sarabha Panjab learned of at least 4 Gurudwaras where this Hukamana was breached. Sarabha Panjab first exposed some of the devious and corrupt people that run our Gurdwaras in June 2007, when Ramgarhia Gurdwara, Graham Street, Birmingham orchestrated an anand Karaj ceremony involving a Muslim boy. The Committee tried to cover this up with lies, one of which included “The young man can not change his name to Singh because of his past”. Sarabha Panjab can now confirm that the Sikh girl who married this boy has now converted to Islam. The boy had no intention of adopting Sikhism, it was a total cover-up by the Gurdwara Committee. Sikh youth are sick and tired of corrupt Committee members making their own rules and abusing the Sikh Maryada. Similarly, last weekend, Singh Sabha Gurdwara, Coventry conducted an Anand Karaj ceremony for a Christian boy. Again saying he cannot change his name for whatever reason – NOT GOOD ENOUGH!! People plan months, sometimes years in advance for their wedding. “Not having time to change name to Singh” – This is no excuse! It is about time Sikh Sangat stand up and question these so called leaders into their actions. Note: There are some devious members of a particular committee who are trying to turn this debate into personal feuds and anti-Jathabandi. We make it clear; this issue is NOT against any Jatha, group or individuals. This campaign is solely for the preservation of Akal Takhat Maryada, Sikh ethics and Gurudwara code of conduct. This is a message to all the Sikh Sangat that according to the Rehat Maryada only Sikh couples (male/female) can engage in the Anand Karaj Ceremony. If the couple or either one of them is not a Sikh, then they must embrace the Sikh faith. 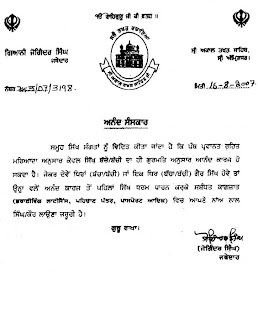 This includes that they must change their second name to Singh or Kaur in their official document (e.g. driving licence, identity card, passport) before the marriage. I am Amanpreet Kaur, a 22 year old girl born in Ludhiana, Punjab. When I was 19, studying BCA, I fell in love with a Hindu boy named Sameer. We would talk for hours and it was clear that he loved me back. We would always talk about living a happy life together but never really discussed religion. Religion is a big part of life in India. Indians are very religious people. My family was religious but they hardly told me anything about Sikhism. Everything I learned about Sikhism was from the school in which I studied ‘till twelfth grade. I knew about Guru Nanak Dev Ji and his teachings and that Sikhs are to worship one God only. I knew a little bit of the history, Sikhs fighting with Muslim emperor Aurengzeb to save Hindus. But little did I knew about differences between Sikhism and Hinduism. All I knew was Sikhs do not believe in caste system and do not worship Hindu Gods like Brahma, Krishan, Ganesh, Durga, Kali etc, as mukti (salvation) can only be attained through the meditation on One God, who is above all. Sameer told me that I do not have to convert to Hinduism in order to marry him. He told me that I can still practice Sikhism if I wanted to. Marrying a Hindu didn’t seem a big of deal to me but my parents told me that I should marry someone with the similar belief system, a Sikh. There arose a huge fight in our family but blinded by love I insisted to marry Sameer only. Anyway, we got married. Our marriage was conduct according to Hindu marriage ceremony. Everything was going well for the first couple of weeks until his parents started forcing me to do Durga Puja (worship). I resisted but they said it is the practice of their family and I have to do it. I told Sameer and found him surprisingly in agreement with his parents. He said I can perform Sikh practices but being in their family I have to do Durga Puja. The conflict started arising not only because of Durga Puja but also due to daily Hindu rituals. For example always referring to Hindu Gods while talking, fasting for certain periods, considering fire as sacred, and much more. They kept forcing me and taunting me and I started performing Durga Puja. I felt very awkward worshipping the stone statue of Durga. One day I decided to search the online version of Guru Granth Sahib about what my Guru says about performing other worships. I found out that Guru Ji condemns the worship of anyone else except God. As I read more and more of Guru Granth Sahib and some of the articles written by Sikhs, my eyes lit and I was amazed that my Guru offers such beautiful and true teaching. I felt embarrassed for not knowing it until now. Everything a girl could ever imagine is in Sikhism. Guru ji gave women equal status as of men, equal rights and self-respect. My Guru made me a princess by giving me the last name, Kaur. I felt really ashamed and embarrassed having betrayed my Guru. The next morning I told Sameer that I will no longer perform Durga Puja. When my mother-in-law heard this from Sameer, she became furious and started cursing me. And started telling Sameer that he should leave me. That morning I did not perform Durga Puja. One day Sameer came home and told me to get ready. I asked him the reason and he said it is a surprise. I had no idea where he was taking me until he took me to a mandir (Hindu Temple). He had tricked me to go to the mandir to do Durga Puja. I refused to get out of the car. He kept trying and even tried to drag me. Watching my resistance, he became furious and drove back home. He did not say a word and when we went in our room he slapped me. The slap was so unexpected and hard that I fell on the ground. I started crying and he started yelling. I wept for the whole night. Slowly our marriage grew apart and we got divorced. I still regret my decision of getting married to Sameer. Sometimes our emotions make us blind and all we want to see is what suits our eyes and we ignore everything else, unaware of what we ignored will come back to haunt us. My advice to all Sikh girls is to marry a Sikh so that there would be no room for religious conflicts. who are now been bought up as Hindu's. I also was with a white guy for two years but his family wouldn't accept me after the 7/7 bombings they thought i'd turn their son into a terrorist??? Anyway, I agree with them people who think you should only marry your own. By the way, where are most of you from, no one down my area agrees with alot of your views, however I do. Carry on with the good work it's about time people got things off their chest, its the only way we'll resolve these issues. DON'T CUSS THE BABBARS EVERYBODY ! IM A BABBAR AND THINK THE WEDDING WAS WRONG, NOT ALL OF US ARE BAD IN EVERY GROUP YOU GET FEW BAD APPLES. THE PEOPLE WHO ALLOWED THE WEDDING ARE NOT THE REAL ONES. HAWARA WOULD OF DEALT WITH THEM IF HE WAS IN THE UK.